For high school homeschoolers contemplating a military career, there are options available to aid in preparing for a military lifestyle. The following programs are available: Junior Reserve Officer Training Corp (JROTC), Naval Sea Cadets, Civil Air Patrol, and Young Marines. Very few of the programs available to public/private schooled students has a homeschool counterpart, but some allow homeschool students to participate. JROTC is a federally funded program that spans across all five branches of the armed forces, with most groups being Army JROTC groups. It is not a program meant to recruit high school students into the military, nor is it necessary for students to have a desire to join the military following their high school education. The main goal is to prepare students to become community leaders and productive citizens. JROTC is open to male and female high school students. As with most groups that are military affiliated, JROTC is structured and organized. Various activities are offered to build confidence, acquire leadership skills, and learn teamwork. In some locations, a student can join a JROTC program as a homeschooler. Currently, there is only one dedicated Homeschool JROTC group in the nation and it is located in Georgia. If students are interested in a local JROTC program, they should get in touch with the local group’s point of contact; that could be the school itself or the instructor. Some schools see JROTC as an extra-curricular activity, making homeschooler participation more likely. Other schools view JROTC as an accredited course of study. Those schools may allow homeschool participation, though several of them do not. Naval Sea Cadets is a program for students ages 13-17, with a junior group starting at age 11. Much like JROTC, students will find the Sea Cadet program to be a great course in leadership and teamwork. Unlike JROTC, however, is that Sea Cadets offer a scaled down version of the Navy’s basic training to introduce students to military drill and discipline, physical fitness, seamanship, shipboard safety, first aid, naval history, and leadership. Additionally, twice monthly drills (weekend training) are common among most Sea Cadet locations. Students interested in the Navy, Marine Corp., Coast Guard, and/or Merchant Marines will find many interesting activities in the Naval Sea Cadets. 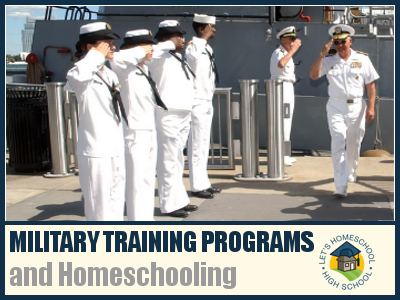 Because Sea Cadets is not held during the school day or an after school program, homeschool students should be able to participate in any location. However, students will likely be asked to submit evidence of good school grades and attendance. Contact your local Naval Sea Cadets group to inquire about participation. Another option for homeschoolers is the Civil Air Patrol (CAP). Like the Sea Cadets, CAP is very accepting of homeschool students. Meetings are usually during the week and/or Saturday. A lot of the same benefits of the previous programs mentioned are true of Civil Air Patrol as well. Students especially interested in the Air Force or aviation may particularly enjoy participating in CAP activities. While being involved in CAP, students could have the opportunity to compete for scholarships to be used toward earning a pilot’s license. Just like JROTC and Naval Sea Cadets, students involved in Civil Air Patrol will have many opportunities to gain leadership experience and learn valuable teamwork skills. The group allowing the youngest members is the Young Marines. Youth ages 8 through high school can participate in the Young Marines with the main requirement being that students are in good standing at school. Weekly meetings and regularly activities make up the Young Marines program. Because the groups meet after school hours, homeschool students should have no problem getting involved with Young Marines. As with the previous groups, leadership and teamwork are priority in the Young Marines, but there isn’t a shortage of exciting activities either. Students would likely learn survival techniques, physical training, hiking, swimming, rock climbing, rappelling, and scuba diving, depending on location of the unit. All of the aforementioned programs do have some similarities. Regardless of the fact that they are military programs for youth, students are under NO obligation to join the military, nor must they even plan to do so upon graduating. However, participating in these various groups will likely earn students an advantage should they decide to join. College scholarships and/or enlisting at a higher rank are common to those who have excelled in their unit. These programs are also low or no cost to join. Uniforms are typically provided. Each unit varies, though, on cost and uniforms so ask those questions when inquiring. In each group, students work hard to earn their rank; the higher the rank, the more responsibility. If a student is interested in participating in any of the above groups, a phone call to the potential unit would yield more specific information. Many useful skills could be acquired from participation in any of the military based units listed. Leadership, community involvement, physical fitness, and teamwork are attributes that will beneficial far beyond the high school years. Besides, learning to fly a plane, conducting survival training, or attending a military camp sound pretty awesome! Two of my children have been involved in the Naval Sea Cadet program for 3 years. We have been involved with 4 different units in those years. Unfortunately, as with any volunteer run organization the group is only as good as the leadership. The first two units that we were affiliated with definitely had leadership issues that trickled down and ultimately affected the unit. Even though we had issues with the actions of individual leaders we still felt that the program as a whole was fantastic, so we kept looking for a unit that would be a better fit for our family. The third unit that we went to was absolutely amazing and exactly what we wanted when we began. The leadership is extraordinary and they run the program exactly how the program was laid out by headquarters. The only reason we left that unit was because a new unit was started closer to us. The new unit was being taught and mentored by the unit we loved. "—John T. Dempster, Jr. Division, of Lawrenceville, NJ, recently informed us of some excitement at their unit. As of this writing, their graduating seniors have some amazing options available to them. BRAVO ZULU to SA Elizabeth Herington (offered Naval ROTC scholarship to Harvard University); PO2 Jenna Kugel (offered appointments to the Coast Guard Academy and the Naval Academy); PO3 Gretchen Mario (offered appointment to the Naval Academy); PO2 Neely Campbell (attending Eckerd College); CPO Connor McDonald (offered appointment to West Point); and PO2 Bennett Mirabito (offered appointment to West Point)." If you are interested in the Naval Sea Cadet program you should check it out for yourself, don't let someone's negative experience posted on the internet deter you from developing your own conclusion about the program. If there isn't one near you, consider starting one. It is a premier youth program that has been in existence since 1958 and currently has over 10,000 cadets nationwide. If it were a bad program I highly doubt it would have lasted so long or have so many members. My son joined the Navy Sea Cadets. We left when the CO of the unit rigged a competition to enable his son to win. We filed a complaint and the CO physically threatened me and cursed me in front of my kids. I transferred my son to the Civil Air Patrol. That was a huge step in the right direction. The Civil Air Patrol was more organized, professional, and their leaders were much more high class and tactful. The Sea Cadets seem to have problems with male adult instructors flirting with underaged female cadets. I am in Civil Air Patrol, but I am trying to start a homeschoolers JROTC. Civil Air Patrol can get expensive. It's very exciting to read such great experiences with some of the programs listed above! How amazing to have such awesome and inspiring organizations available to today's youth! If you live in the Phoenix , Arizona area. My husband and I are in charge of the Firebird Young Marines. A wonderful program, filled with Teamwork , discipline and Leadership. We honor our veterans, we do community service, camp , physical fitness , hike , ect... We do focus on Drug Demand reduction. The Young Marines nationally learn about drugs. but not just do not do them. But what they are, the causes and effects they have on their lives and the family. Long term effects. we also give out information for help, If they know any one who needs help. It has been a success. My son has been in the program for 6 years. He loves it. He is now one of the leaders in the group. The Young Marines are ran by the kids. They are taught leadership , and take charge of what needs to get done. It is really neat to watch all ages work well together. We do not recruit for the Military. But we have had many who go on after Young Marines to join. we recently had a couple graduate. One went off to the Navy and has become a corpsman. The other joined the Marines, and is headed out to Afghanistan. If you are in the Young Marines and obtain a certain rank, upon joining the Military, you will come out of boot camp a rank higher then the others. The Young Marines as been a wonderful experience! Our Website is Firebirdyoungmarines.com and the National Young Marine website is Youngmarines.com . My son has been involved with Civil Air Patrol for about a year and a half, and I can't say enough good about the program. The leadership skills and discipline taught and modeled through the Squadron is so valuable and beneficial. My son isn't planning on joining the Air Force and may not even pursue a pilot's license, but he really enjoys the activities and the opportunity to fly (especially the glider flight). We are also very fortunate in that our local squadron is about half homeschoolers!